Accuweigh’s Perth branch recently supplied axle weigh pads to Simsmetal’s Spearwood branch in WA. The axle weigh pads will be used for confirm axle group loadings and total truck weights to ensure trucks are not overloaded. A pair of axle weigh pads and a digital controller mounted in a carry case was supplied to check the axle weights of trucks picking up scrap metal from remote locations. 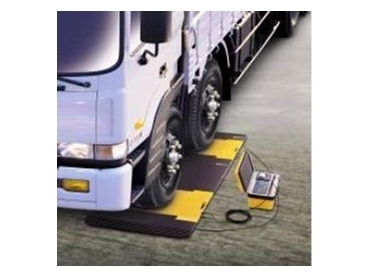 The axle weigh pads are the ideal solution for trucks needing to verify their axle weights when there is no other truck weighing facilities available. The Axle weigh pads from Accuweigh are available fabricated in either aluminium or stainless steel, and are extremely water resistant and vibration proof. The carry case is fitted with a rechargeable battery and a printer to enable the axle weight pads to print axle weight readings and to total all axle weights on a truck and trailer.